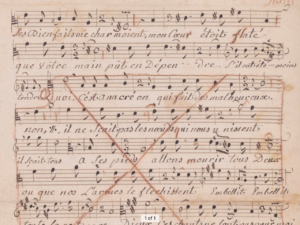 Rameau’s 30 operas are among the most aesthetically complex theatrical forms of the Enlightenment period; as such they offer fascinating opportunities for research into music, dance, dramaturgy, literature and interdisciplinary contextualisation in the wider environment of Enlightenment thought and practice. The principal objectives of the Rameau Project are to explore this extraordinary multimedia repertoire, addressing compelling issues of composer-specific practices — particularly regarding Rameau’s use of choreography and movement — and to develop the expertise in music and dance required to communicate it to a modern audience. During 2017 and 2018, Jonathan has been focussing on new ways of exploring the relationships between the libretto and the score, and how understanding the idiosyncrasies of French prosody might inform our performance of the music. So far this is proving a fruitful line of enquiry, with clear correlations being revealed between the text and metre, ornamentation, rhythmic alterations, use of dissonance, colour and phrasing. Jonathan will present this on-going work at the Utrecht Early Music Festival in August 2018.